** Book 3 nights or more and receive an additional night for free! Valid on stays through 5/16/19. BRITTAINS' BEACON is a 2300 sq. 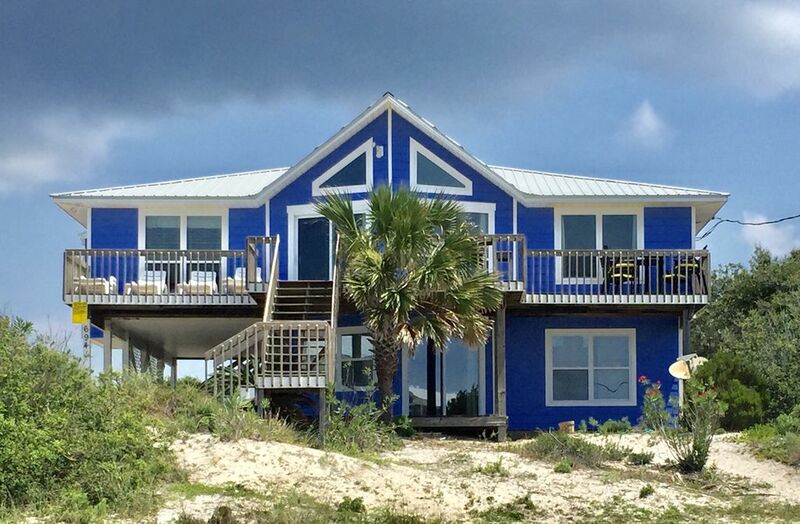 ft., 6 bedroom, 3 bath beach home with 2 separate living areas situated high above the rest on a dune overlooking the beautiful Gulf of Mexico. This property is in a small, low traffic subdivision. The Beaches are wide, easily accessible and blissfully uncrowded. This home has a 500 sq. ft. main deck fronting the gulf with table & chairs for 8 and 6 deck lounge chairs plus shaded lower deck with 4 adirondack style chairs and concrete carport area for an inclimate weather game playing space. Home has large greatroom with vaulted ceiling and lots of glass for spectacular viewing. Lower level family room has 2 glass patio doors also offering the Gulf view. Covered parking for 2 vehicles and plenty of additional parking space, outside shower all on a spacious lot. For the convenience of our large groups, boaters and golfers, who need to fill ice chests, we've installed a Scottsman nugget ice maker that delivers up to 200 lbs of ice per day & a commercial 2 pot Bunn coffee brewer w/ warmer. Beds: Upstairs 4 bedrooms - 1 bed per room K, 3Q & 1 Sleeper sofa in liv rm. Downstairs 1 bedroom & 1 bunk room - 1Q, 1 set of bunks, 2 Q Murphy beds in family room. Downstairs is completely separate from upper level, you must enter each level from outside. For all you golfers, our subdivision is beside Kiva Dunes. If you are not familiar with Gulf Shores, there are dozens of beautiful courses. Our house is great for 2 or 3 golf foursomes. We have 10 separate beds (if you count the sleeper sofa) plus the commercial ice machine & Bunn coffee brewer. Neal and Janet have been in the property management and construction business since the early 80's. Janet currently has a business managing over 800 single family homes in NE Alabama, where they live. She is an Army brat whose father was a helicopter pilot stationed primarily in the SE. She graduated high school in Alexandria, VA and has a Finance degree from Jacksonville State University in Alabama. Neal has lived in Calhoun County, AL his entire life and graduated high school in Alexandria, AL. Neal's master carpentry skills and Janet's love for all things real estate make them the perfect team. They have 2 adult children, a yellow Lab and lots of brothers and sisters that love to spend time at Brittains' Beacon. Neal is a true outdoorsman. He and Janet's 4 brothers love floundering out front, fishing the bay for trout, sea bass, and deep sea fishing. Janet and the ladies mostly enjoy sunbathing on the deck and the beach. What we love about our location is that the beaches are uncrowded. The Fort Morgan area has regulated against numerous multiunit condos thus keeping the beach population down. We were drawn to our specific property because of its elevation. We are 27 feet up on a dune giving us a spectacular view of the gulf and still a short 100 yard walk to the water. The size of our home is the perfect fit for our family gatherings and yours too! The openness of the main living area into the kitchen and dining area with the vaulted ceiling and glass doors at the front allows for 18 people to be all in one space and not feel crowded. The commercial ice machine and the double Bunn coffee maker are a huge hit with our large groups. Even though we are across the street from the beach you can easily watch the beach fun from the deck or even inside the living room. We are less than 100 yards to the WATER! We have a tremendous view of the ocean from both lower and main level decks and home interior. password protected. password on site. will seat 10 with large, flat screen TV, DVD player and view of the Gulf all open to kitchen/dining and bar with additional seating for 12. Smooth top, electric, self cleaning range. Bunn with 2nd pot and warmer plate. Gas burner w propane bottles for Low Country Boil or fish fry. Very large stock pot w/basket. An abundance of dishes, serving pieces, skillets and cooking instruments. Smooth top stove, Dishwasher, 2 full size Fridges, 1 w/ice maker + commercial ice machine on ground level, breakfast bar w/ 4 stools. Very large assortment of books provided. If you are in the middle of one and its time to leave .... by all means take it with you. Maybe you can leave one in its place but if not that's fine too. Large sun deck w/4 chase loungers and apx 12 chairs w 3 small tables and a smaller shaded deck at walk-in level. There are many skim boards, floats, balls, sand buckets, toys etc. These have been left by previous tenants and are for your use and you need not feel obligated to replace if broken. The ground floor is accessible w/ wide doorways, however, there are 2 small steps up to the bath facilities and just a small kitchenette on this level. There is a dining area, living room, and sleeping quarters. Scottsman Ice Maker with 300 lbs. daily capacity, Commercial Bunn coffee brewer w/2 burners, Chest freezer, baby high chair, Smoking outside only, Dogs allowed upon approval, Upper sun deck, Lower shaded deck, hammock, High volume fan for those rare days when there is no breeze, gas burner w/ large stock pot and basket for country boils, fish frying pan. Great house!! Had a great week. We celebrated Christmas at Brittain Beacon(12-21-12-29-2018)with family and friends and thoroughly enjoyed ourselves. We had room for everyone. The house is very clean and well maintained. The beds are very comfortable and the bathrooms are large. We especially appreciated the well stocked kitchen(stock pots, utensils, griddle, Bunn coffee pot),the commercial ice machine(will produce 200 lbs. of ice a day. We didn’t use that much but it was great ice for coolers and drinks! ), easy access to the beach and the upper and lower decks with beautiful views! We would definitely recommend it to our friends and plan to stay here again! This property is so well kept. Absolutely everything there you could possibly need and more. Anytime we needed anything, we'd just say, it's here, we just have to find it. Books, games, sand toys for the kids. Perfect deck for morning coffee. Great beach right across the street and non-busy streets for nice walks. Hoping to be back next year. Brittain’s Beacon is stocked with everything you need, except food. The location very beautiful and convenient they were updating the house 100 yards from the beach I would give the 4 stars . The house was very dirty stain carpets pet hair a couch that smelled like urine .If your gonna rent to pets u need to do a deep cleaning . My 1 yr old grandson walking and crawling in dog hair we vacuum and had to wash bedding I'm allergic to animal hair ! We had to make all the beds really. Plus ice machine close to the beach we could watch our older children and things from the house . Washer and dryer not to far from town . We are minutes from Fort Morgan and the Dauphin Island ferry. There is bird watching and annual bird banding and tours of this historical Fort.